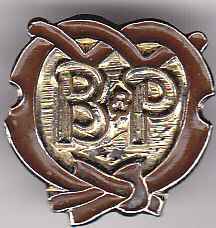 The Promise Badge is the most important badge a member can receive - it is a sign of the lifelong commitments she has undertaken at her special Promise Ceremony, and, particularly in the early days, the badge was described as the Guide's 'life', and being asked to surrender it to the Guider, even temporarily, was considered the ultimate punishment for misdemeanours. The Promise is a lifelong commitment - for all their life, whether long or short, whether they stay in the movement long-term or leave soon after, they are committing themselves to the ideals in the Promise. And in return for that commitment they receive their special Promise badge, a physical reminder of the Promise they made, pinned on by the person who received their personal commitment. Although dates are given below for when new designs were introduced, it should be stated that these are simply the dates when stocks of the badges first became available nationally - many Guiders would have used up their supplies of older styles before obtaining/starting to issue new-style badges, so there may be instances where what you received doesn't match the dates stated below - I have known of oval 1940s Brownie Promise badges being issued into the 1950s! Equally, different manufacturers were used, sometimes simultaneously, so all sorts of minor variations in shape, style and colour can be seen - the pictures below should be taken as typical versions only, and do not show every version or variation which can be found! Each part of the Promise Badge has a meaning. 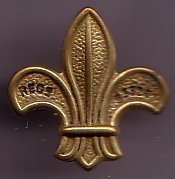 As with the Scout Promise Badge (the fleur de lys) the Guide Promise Badge (the trefoil) has 3 leaves, to symbolise the three main elements of the Promise (faith/belief, national loyalty, service). It originally had two Gs, to indcate the promise and law, and a star with 5 points (and therefore 10 if you count the 'inner' points too) to symbolise the original 10 Laws. At the base is a scroll in the form of a heraldic feu, or flame, and a compass vein pointing upwards, to show the direction a Guide should always aim. 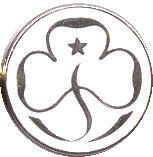 The Promise Badge for the Guide section has always been produced in brass or brass-coloured metal. You may see versions in silver (or later silver-coloured) metal - these were Commissioner Promise Badges. Also, prior to 1994, Guiders wore their last Promise Badge, so for some that would be a Ranger or Cadet Promise Badge, for many a Guide Promise Badge. 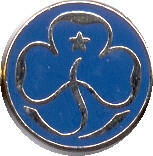 If someone had not been a member in their youth, then when they made their Promise they received a Guide Promise Badge. In 1994 a special Promise Badge for Guiders was introduced, to be worn instead of their Brownie/Guide/Ranger/Cadet Promise badges. Over the years Guiding Promise Badges have changed in style many times. I hope to gradually add to this page, including pictures of the different badges and variations for each section. If you spot any errors, can confirm any vague details, or can fill in any of the blanks, please do let me know! Before Rainbows existed, in Northern Ireland there were Bunnies. 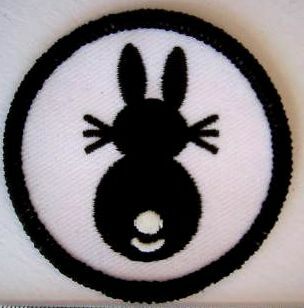 Their Promise Badge showed a seated rabbit in black, on white. 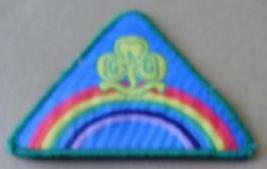 The original Rainbow Promise badge was a triangular cloth badge, featuring a Rainbow under a Guide Badge. It was sewn against the neckline of the tabard, with the upper point of the triangle meant to touch against the binding on the top edge of the tabard. It was then changed to fit in with the other section promise badges, and was a yellow trefoil on green - again a cloth badge, as it was considered unsafe for Rainbows to have metal badges. A separate felt rainbow was later made available to sew above it. Souvernir sets of the different Promise badges were sold on a card, which included a metal version of the green Rainbow Promise badge, which may cause confusion . . .
A metal badge was introduced with a sky blue background, to m atch the new Rainbow uniforms which were brought in, but it didn't last for long before the current Promise badge was introduced. Originally, the section were called Rosebuds, and had a badge featuring a Rosebud, designed by the founder of Guiding, Agnes Baden-Powell. It wasn't around for long, as by 1917, it had been replaced by a new badge, an acorn within a brown circle. (the two badges shown here are both modern replicas - originals are extremely rare, and very valuable). It is believed that the acorn badge may sometimes have had holes either side for sewing on, rather than a pin, and they aren't always made of metal, sometimes they are disks of a thin plastic-style material. By the 1920s the 'Brownie Man' made his first appearance. Originally the badge was made with a thin wire pin, as shown on the left, but this was found to be very flimsy, and breakages were common. By 1932 he was shown on a broader metal bar as shown on the right, which was sturdier (although there was still a risk of the arms and legs becoming bent during polishing), and this design continued more or less unchanged through to 1968, except . 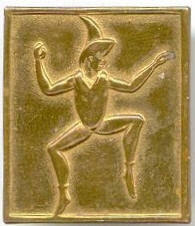 . .
Wartime restrictions meant that the cutout Brownie man was too time consuming and wasteful of materials to manufacture, so two alternatives were introduced, both of which featured the 'Brownie Man' design stamped into a piece of soft brass - initially a rectangular design was used, and then for the rest of the war a smaller and more economical oval shape which used less metal. There is also evidence that during war, metal badges may have been unobtainable at some points, as homemade cloth badges have been seen - certainly, during wartime there were general problems with Guiding equipment supply, both through factories focussing their efforts on producing war goods, and the shortages which could be caused by the bombing of warehouses, transport routes, imported materials etc. The next change came in 1967, amid the major programme changes which took place for all sections. 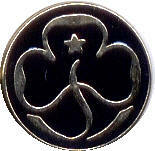 To show that Brownies were a full part of the Guide family, they now became 'Brownie Guides', and a Guide Trefoil was incorporated into the design of their Promise badge to show this, surrounding the 'Brownie Man' in a hollow design - and now in a silver-coloured metal which did not need polishing. However, again, cost came into play - the intricacies of the cut-out were proving too expensive, so in 1971 a revised design was brought out, which did away with these issues by having a solid, filled-in background, and which featured the GG letters seen in the other section Promise badges of the time. Later, they style of pin was changed from a normal clip style, to one with a revolving safety catch. The next change came in 1994, with the introduction of more closely linked Promise badge designs for all of the Guiding sections, so it was back to being a brass colour (strange how so many changes in Guiding involve changing back to what went before! 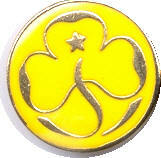 ), with the Brownie badge featuring the re-styled trefoil, on a yellow mock-enamel background. That style didn't last for long, because they changed the style of the Guiding logo, so had to change the Promise badges. 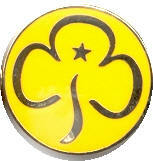 They kept the same Promise badge styles and colours, so the current Promise badge features the new-style trefoil on a yellow background, as shown. 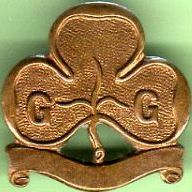 The original Girl Scouts used the Brass Scout Promise badges and insignia, and continued to do so as Guides until such time as Guide ones became available - the date for this varied around the country - but from around May of 1910 the new promise badge became available - a brass trefoil with BP on the topmost leaf, and G G on the two side leaves, the three leaves being considered to denote the sections of the threefold Promise and the lettering designed to indicate that they were 'Baden-Powell Girl Guides' to distinguish them from the various groups (sometimes referred to as "Monkey Patrols") which sprang up keen to copy some of the elements they found to be fun, and to skip those which seemed dull and worthy, like obeying the Laws and doing good turns! Guides were expected to polish their brass Promise badges, both front and back, every week - and Guiders would often check to see they had - hence some vintage badges are almost polished smooth! 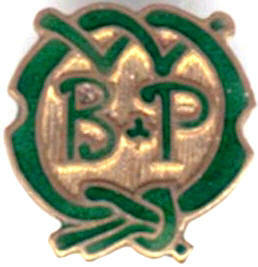 By 1921 the BP lettering was gone, (probably because the issue of 'Monkey Patrols' had died down) and the trefoil featured a wider, blank scroll as shown above left. Soon it appeared with a cut-out 5-pointed star in the middle of the top leaf as shown above right - each of the inner and outer points of the star being said to represent one of the then 10 Guide laws, as an extra aid to remembering them. 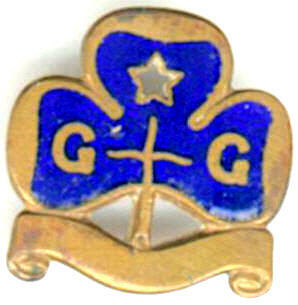 In 1932 it was altered again, this time to have a straight stem and stalk rather than a curving one, and the text 'Girl Guides' was added along the scroll - this is the most commonly seen design, as it was around for the longest time - from 1932 right through to 1968, which was also the era when Guide membership was at it's highest. It appears that, unlike with Brownie badges, production of this design was able to carry on right through World War 2, as I have not been able to trace any sign of shortages beyond the general ones, or of alternates being used. In 1968 it changed once again, now having a much narrower scroll, which was plain again. The star also disappeared, and the stem curved. Indeed, apart from having flattened scroll-ends rather than shaped ones, and it now being in a metal which did not need polished rather than being in proper brass, the new badge was really rather similar to the Promise Badge of almost fifty years before - don't be confused! 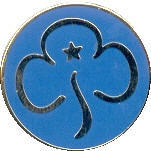 1994 brought the standardisation of Promise Badges across all the Guiding sections, the Guide Promise Badge being a trefoil on a mid-blue artificial-enamel background. 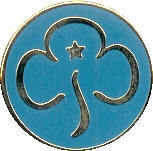 The current design features the new-style trefoil on a mid-blue background. The origins of the Senior Section lie with Senior Guides, which started in around 1915, with their name changing to Rangers in 1917 - later known as Land Rangers to diferentiate them from the specialist branches Sea Rangers and Air Rangers. 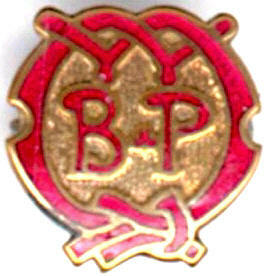 Their original promise badge for Rangers was the same as the Guide one of the time, but with a red enamel fill, as shown on the left. Sea Rangers were introduced in the early 1920s, and their promise badge had a dark blue enamel fill. When Cadets started in around 1916, their Promise badge had a white fill in the centre, with a navy blue fill in the tips of each of the trefoil's leaves, the white colour echoing the army tradition of cadets wearing white fittings to their uniforms until qualified as officers. In 1967, the different Ranger sections and Cadets were abolished, the Land Rangers, Sea Rangers, Air Rangers and Cadets all simply became Rangers, and wore a Promise badge with aquamarine enamel as shown on the left, to match the new aquamarine blouses and aquamarine-piped navy air-hostess style hats worn as uniform (although badges appear to have continued to be produced in Land, Sea and Air Ranger colours for a time, in the new-style trefoil shape - might this have been for export, or for breakaway units, or as a transition measure? In 1973, the Young Leader Section was started, with broadly similar aims to the pre-1967 Cadets, and although they wore the same aquamarine uniform as the Rangers did, they got their own Promise badge in the same style, but with white enamel. 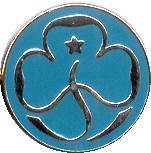 With the standardisation of Promise Badges across all the Guiding sections which was done in 1994, the Promise badges for Young Leaders and Rangers featured the trefoil on an aquamarine or white background as appropriate. The separate Young Leader Promise Badge (shown on right) was recently abolished, so now all Senior Section members wear a new style trefoil with aquamarine enamel, as shown on the left, regardless of whether they are Rangers, Young Leaders, or both - back to 1967 I guess! 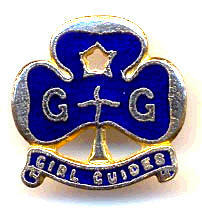 For most of the history of Guiding there was no separate Promise badge for Guiders. Up until 1994 the rule was that Guiders wore the Promise badge of the last section they were members in, or if they had not been Guiding members in their youth, on making their Promise as a Leader they received a Guide Promise badge. Commissioners wore special Promise badges which were identical to the ones for Guides, but in silver (later silver coloured metal). In 1994, in a departure from previous policy, a separate Promise Badge for Guiders was introduced, in the same style as those for the other sections with a trefoil on navy (almost black) mock-enamel, and the silver Commissioner Promise badges were no longer issued. 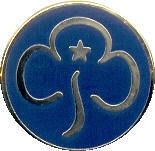 The current Guider Promise Badge features the new style trefoil on navy enamel (it is a much lighter shade of navy than previously, as can be seen from the pictures, and may thus be at risk of confusion with the Guide Promise badge). From 1932 to 1968, as well as their Promise Badge, Guiders wore enamelled Warrant Badges, which served to indicate which section they worked with in their leadership role. Brown Owls wore a badge featuring an owl's head, as shown on the left. Tawny Owls wore a badge featuring a full-length Owl, as shown on the right. There were some Warrant badges made in th e style of the Guide ones but with Brown enamel - these were made only for Brownie Guiders in those countries of the Commonwealth where they followed the British Brownie programme, but did not use owls as part of it, either because the birds simply did not exist in that c ountry, or because Owls did exist but had a negative image there. These brown-enamelled warrant badges are especially rare because they were only introduced in the 1950s and stopped in 1968, so comparatively few were issued - and only in the Empire/Commonwealth, not within the UK itself. 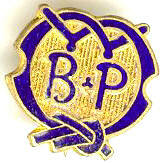 The warrant badges all feature the letters BP with a small trefoil between the letters, surrounded by a knotted scroll, and are shown in the picture below. Guide Captain Badges had green enamel, Lieutenant badges (for all Guide/Ranger sections) were not enamelled, Sea Ranger Guider Badges had navy enamel, Land Ranger Guider Badges had red enamel, Air Ranger Guider Badges had light blue enamel, and Cadet Guider Badges had white enamel. In the Republic of Ireland, badges of the same design are apparently still issued as standard, something for collectors to be aware of and check before paying large sums for what may turn out not to be vintage. Trefoil Guild was officially founded in 1943, based on the assorted 'Old Guides' groups which had existed both unofficially and semi-officially from at least the 1920s onwards. 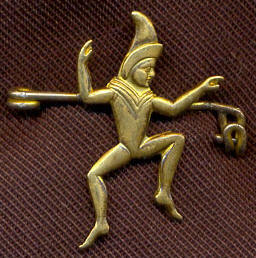 Until 1994, their Promise badge was a trefoil with a scroll underneath, with the text 'Trefoil Guild'. The scroll was enamelled in red. 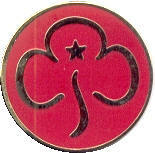 From 1994 they had a promise badge featuring a trefoil on red mock-enamel, in order to show their role in the Guiding family. 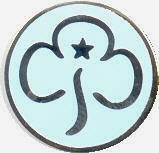 Their current Promise badge features the new style trefoil on red mock-enamel. Until 1994 these featured a large enamelled letter L superimposed on a trefoil - the colour of the enamel indicating which section they applied to (blue for Guide, as on the left, red for Land Ranger as shown on the right). Since then, they have had a round woven cloth badge with a curly 'L' set on a trefoil, in the same style as a pre-2002 Guide Patrol badge. Extensions was the name originally given to the section specially created for Guides with disabilities - because the Guiding programme and activities were 'extended' to incorporate them. Some of these Guides would belong to special Extension units, based in a school or home for the disabled, or in a long-stay children's hospital (at the time it was not uncommon for ill or disabled children with some conditions to spend months or years in hospital), others might be housebound, at a time when many disabled children did not receive any formal schooling. Housebound Extension Guides would often receive their 'meetings' by post, where possible local units were encouraged to adopt and visit them too. Their promise badges had lilac enamel. 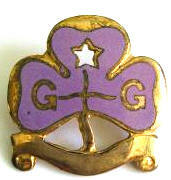 Gradually the girls were absorbed into mainstream Guiding as far as possible, and from 1968 they wore standard Promise badges for the section they belonged to. These Extension badges can easily be mistaken for Air Ranger Promise Badges, as there is quite a lot of variation of shade of enamel in both sorts - collectors beware! These feature the letters LA in dark blue enamel. Local Associations were supporters' groups who worked to help units or Districts with fundraising, admin and other background work - they are now known as 'Friends of Guiding'. It is not clear when these Promise Badges were introduced, but they certainly existed before 1968, and they seem to have been withdrawn in/by 1994. These were in the same style as Guide Promise Badges of the given era, but were silver-coloured. Originally they were in full and hallmarked silver, later they were produced in a more economical silver-coloured metal which did not need to be polished.